George White Marston (1850–1946) was a successful businessman and department store owner. Marston served as president of the Park Board, founded the San Diego YMCA, serving as its president for 22 years. 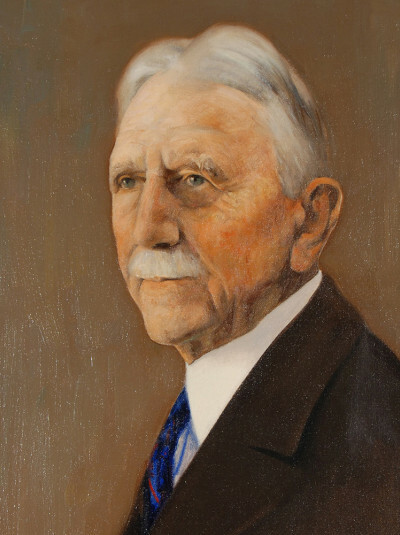 He was on the city council from 1887–1889, chairman of the Parks and Beaches Association, and later created Presidio Park and founded the San Diego Historical Society. He ran for mayor as a champion of the City Beautiful movement and lost twice. Marston also raised funds and donated his own money to buy land for present-day Torrey Pines State Reserve and Anza-Borrego Desert State Park. Marston was chair of the Panama-California Exposition’s Buildings and Grounds Committee when the Olmsted Brothers were hired in 1910 as the Exposition’s landscape architects. Distressed by the decision of the Building and Grounds Committee to go with Frank Allen’s and Goodhue’s plans to place the core of Exposition buildings on the Central Mesa, Marston resigned as chairman of the committee. The Olmsteds resigned when the decision was final. Announcing plans to preserve the “temporary” Exposition buildings to house exhibits after the close of the Exposition, the San Diego Museum Association filed articles of incorporation. Marston was elected president of the association. When those temporary buildings began to deteriorate, Marston led a campaign to raise funds to repair them. …adapted from Wikipedia, the Journal of San Diego History, and from Balboa Park and the 1915 Exposition by Richard W. Amero.